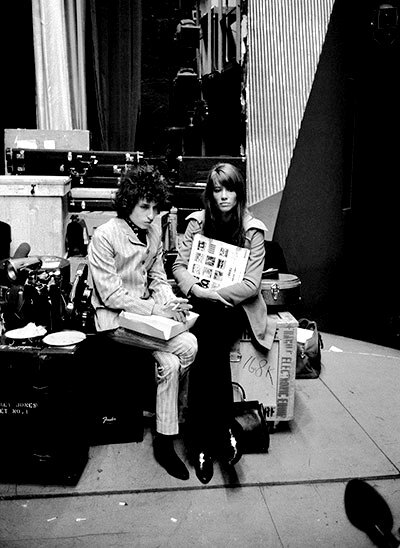 Dylan, who is having genuine trouble tuning his guitar throughout the first half of the show, receives an unusual crowd response: hostility during the acoustic set. According to one report in Pop magazine, Dylan’s standard seven-song set laste’d 65 minutes. Clearly frustrated, Dylan tells the hecklers, “Go to the bowling-hall until I’m finishe’d'” When he returns with the Hawks for the second half, the curtains open to reveal a massive American flag draped across the back of the stage. The French press respond with predictable fury. The concert is recorded for French radio but it is not broadcast. According to one source, Dylan vetoed it at the last minute. The assertion that Bob had “genuine” troubles with his guitar tuning are not necessarily to be taken at face value. I saw him a full week beforehand and he also tuned his guitar in the first half. Several times. He hadn’t had time to get it sorted out before arrival in Paris? Hardly. It is hard, for me at least, not to interpret the repeated tuning as a deliberate act. Though he did not use the Stars and Stripes as a backdrop in the British Isles. So why did he do so in the Paris show?